Zai, a name which I read while coming back from GK-2 has been on my mind since then. My research said it meant ‘seventh heaven’ in Roman and ‘form of perfection’ in Persian. When I recently got a chance to review this place, I thought why not try out the seventh heaven on Earth. Zai is located at Masjid Moth in Greater Kailash-2. Team ChicLifeByte entered through the grand wood and glass door which even had a victorian watch outside. 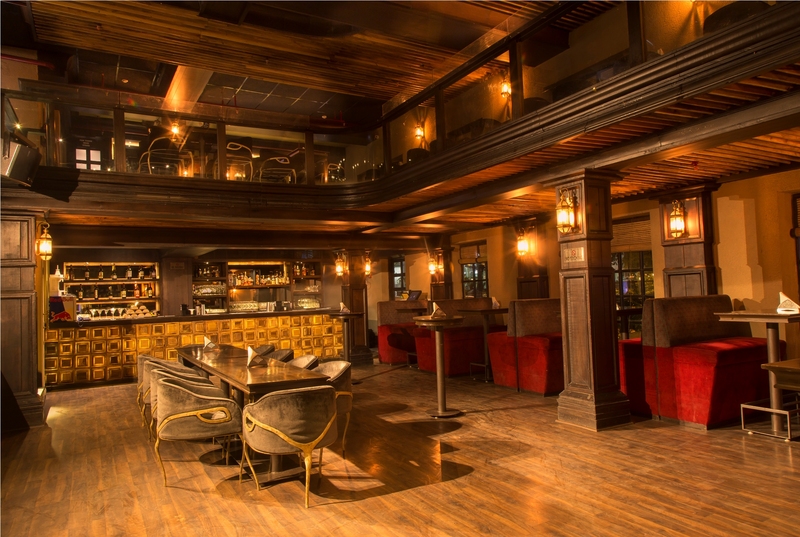 The interiors were internationally styled giving a tasteful and sophisticated European look & feel. With a big chandelier and bright lamps all across, the restaurant surely left a good first impression. The 100 seater restaurant spread across 2 floors with an outside sitting has also witnessed some influencial guests including the veteran actor Dharmendra, Honorary Mr. Salman Kurshid and quite a few CEO’s. They are soon completing a year of existence and would you like to know the plan for their very first anniversary? They are inviting all their regular and loyal guests for a gala evening. It is a small way of thanking them on behalf of the entire Zai team for their dedicated loyalty and love throughout the year. I am sure guests would love this gesture. We were greeted by Prakash Singh, the manager of the restaurant who took us around the Resto Bar. We made ourselves comfortable on one of the couches on the first floor. We really liked the differential seating – from couches to chairs to stools, they had something for everyone’s liking. Prakash sent across the food and drinks menu which had an offering of Indian, Continental, Oriental and Mediterranean cuisines. 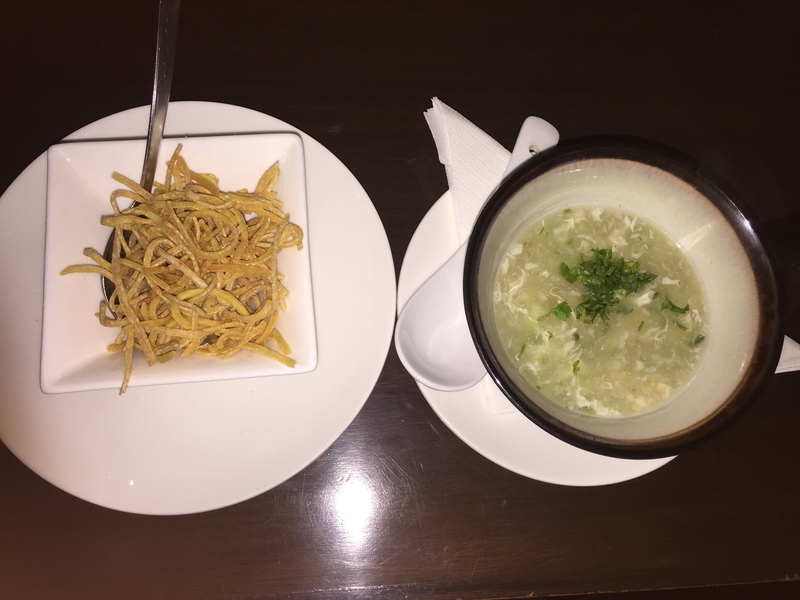 As winter has already started we thought of starting Zai’s food test with Chicken Manchow Soup. The soup felt absolutely soothing on our throat and tasted great. Finely chopped Chicken with chopped carrot, cabbage and coriander gave a great taste. Crispy fried noodles given with the soup enhanced the taste. What caught our attention was the way it was presented. The soup was presented in a wide cup rather than the bowl. Certainly a great start. Then came our mocktails. The Melon Beach Mocktail had fresh watermelon slices, lime juice, sugar syrup, crushed ice with a sprite and soda topping. To give it an artistic look watermelon balls were put on a stick. It certainly looked great. Being a watermelon fan myself, I could not resist the temptation and it did satisfy my taste buds with its great taste. 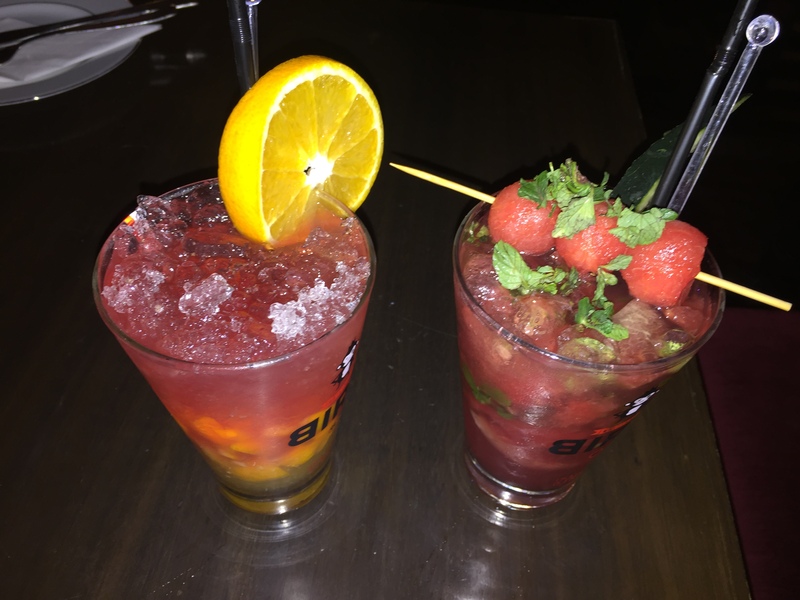 The next mocktail was Zai Twist which had orange chunks, peach syrup, lemon, sugar syrup, crushed ice, orange and cranberry juice. It was clearly a twist – flavourful and nice. However, there was a strong orange flavour which made the drink tangy. For starters, we played it safe by ordering a veg and non veg platter. A great way to order variety without too much quantity. Both the platters were given with sliced onion and mint chutney. The Veg Platter had Dahi Kabab, Stuffed Soya Tikka, Hara Bhara Kabab and Paneer Tikka. Dahi Kabab were tender and nice though I found them a little sweet. Stuffed Soya Tikka was fresh and soft and tasted good. 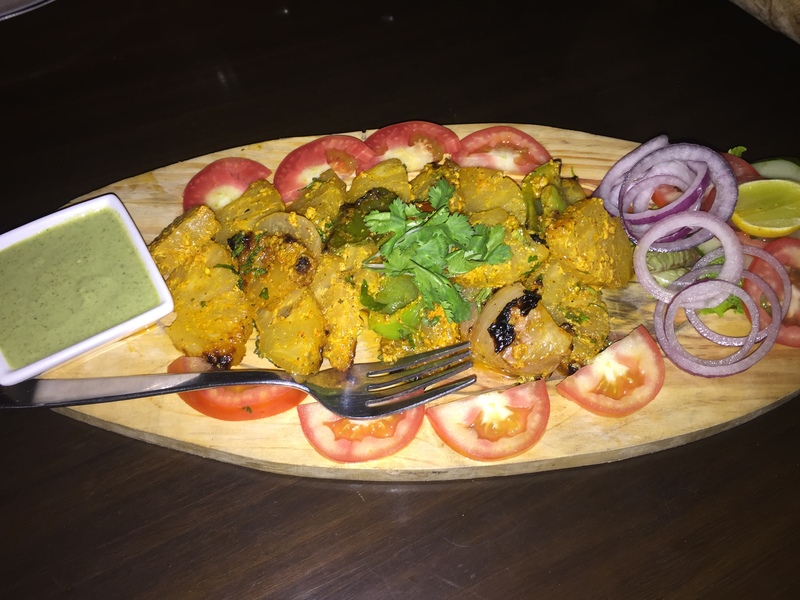 Hara Bhara Kabab was flavourful and even had nuts which enhanced the taste while Paneer Tikka was soft and marinated to perfection. Though they could be spicier but tasted great with chutney. 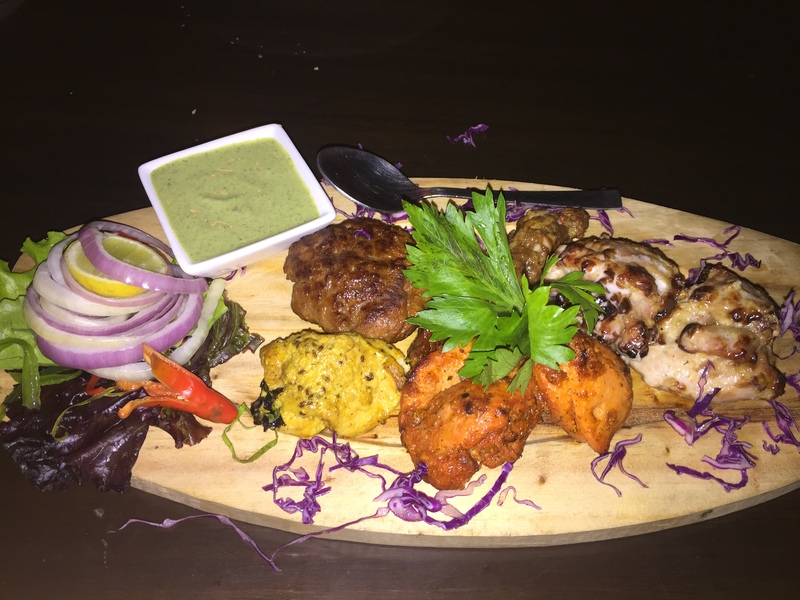 The Non-veg Platter had Fish Tikka, Mutton Galouti, Chicken Tikka, Mutton Seekh Kabab and Malai Tikka. 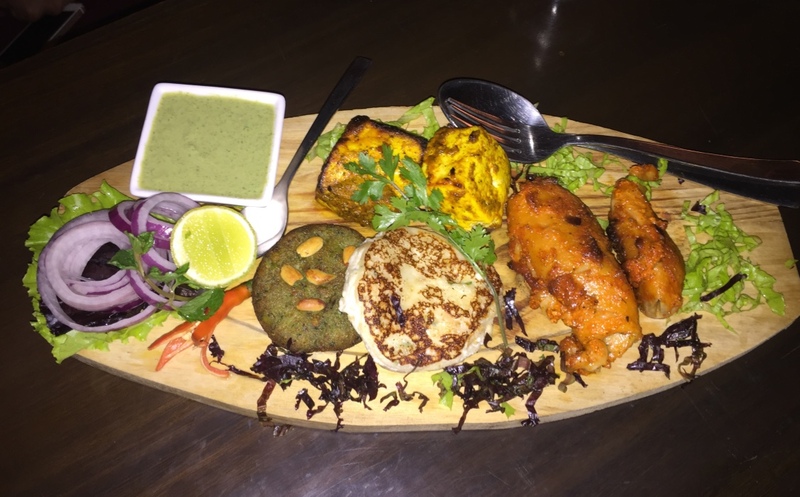 The Fish Tikka made with Sole fish was the star item in the platter which just melted in the mouth. The Mutton Galouti was nice and had a great taste. The Chicken Tikka was nice but not as good as the mutton counterpart. Mutton Seekh was fresh and succulent but I found them a little salty. Malai Tikka was decent but mutton surely won the game. The enthusiastic staff got us our next dish which was Nachos with Salsa, a part of the continental appetizer section. 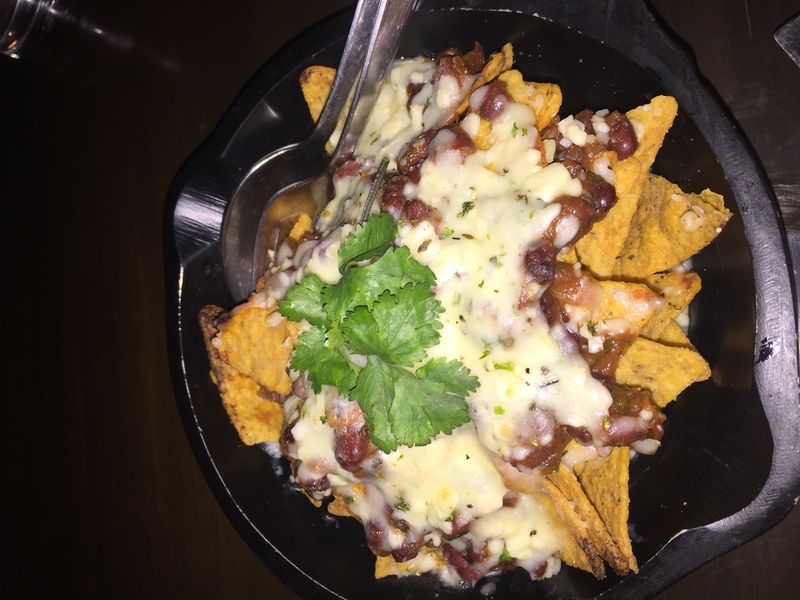 Thin, crispy nachos were topped with cheese, kidney beans and coriander. Though I am not a kidney beans fan but it tasted good. 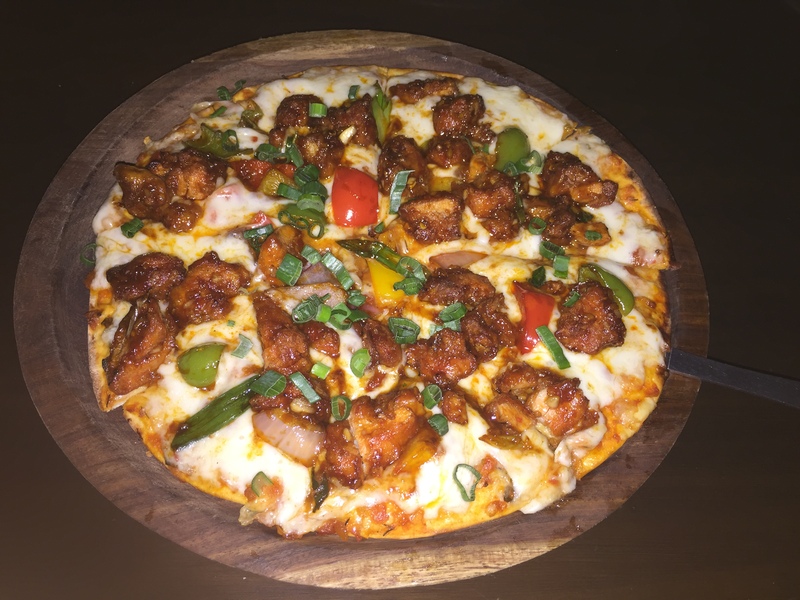 Next was Chilly Chicken Pizza. I am a fan of both Chinese and Italian cuisine and thought this dish would be a perfect fusion. Even the chef recommended it but I was honestly not impressed with the taste. I would certainly prefer the chilly chicken separate from the pizza. The next dish on our test was Achari Pineapple Chaat from the Indian Appetizer section. With sliced cucumber, tomato and onions on the side, the dish looked really colourful and interesting. Pineapple pieces were juicy, nicely marinated and cooked to perfection along with pieces of capsicum. The last dish we ordered was Crispy Fish Burger. The burger was accompanied by tomato ketchup, cocktail mayo and mustard sauce. 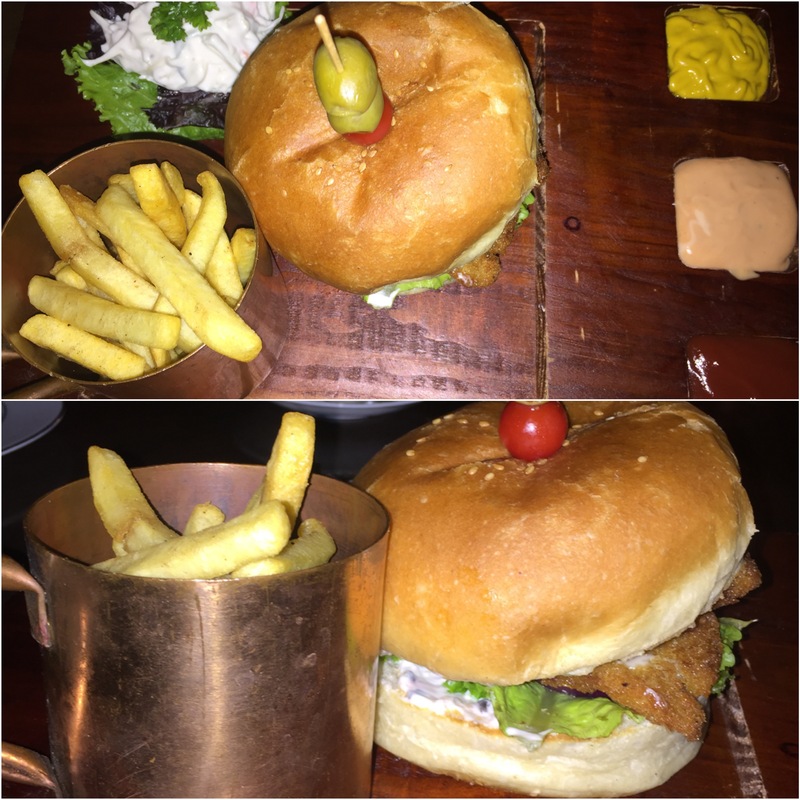 The burger made with Basa fish was served with fries and coleslaw and topped with cherry tomato and olive on a stick. As I took the first bite, I found the crisp patty quite delicious. The bun had onion and lettuce with the crisp fish patty. Definitely, the best dish at Zai. Now, it was time for the sweet ending. For the same we ordered Brownie with Vanilla Ice Cream and Gulabi Kheer. 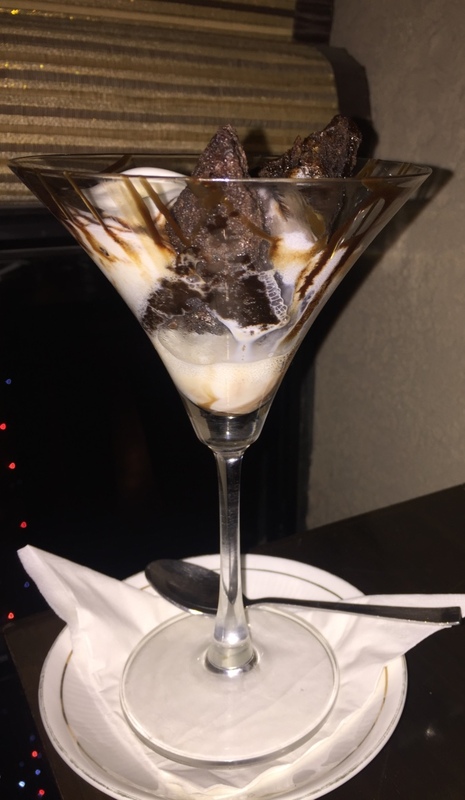 Vanilla ice cream poured over warm brownie with layers of melted chocolate made it divine and as we took the first bite, we thought we were in heaven. 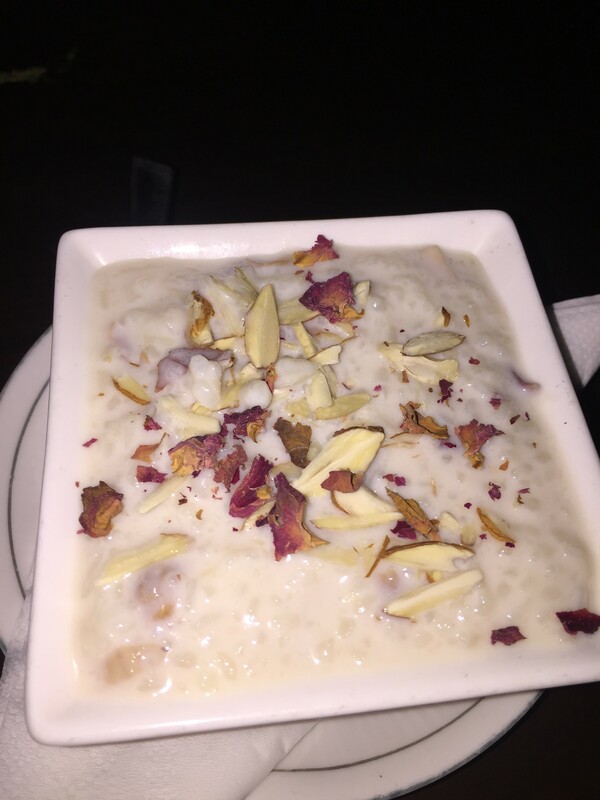 Gulabi Kheer had chunks of chopped almonds with rose petals sprinkled over thick and creamy kheer. Rightly sweetened and yummylicious. Zai is a start up venture of four young dynamic individuals. Saurabh Babbar, Saurabh Mehta who looks after marketing and PR, Sharan Parashar who looks after events, gigs and music, and Loveleesh Hasija who takes care of overall operations and administration. Zai claims to have made its foot hold in the market that was supposed to be saturated. They were competing with a lot of well established names as an entrant an year back and today can safely say that they have become a regular name amongst the foodies and music lovers. On Friday evenings, you would hear bollywood as well as English tracks while on Saturdays you would hear only Bollywood numbers. Sunday is an action packed day with live performance by music sensation Hiten Pawar. Zai proudly claims to be the best place even on a Sunday night. The management claims other places don’t come alive on a Sunday night as Zai does. We went on a pleasant Monday night and were enjoying ourselves to the rhythm played by DJ Dale. The management surely knows how to source the right talent. We caught hold of the young Executive Chef Nitin Sikka who leads a team of 9 other chefs and joined Zai on his birthday last June, the day he turned 25. 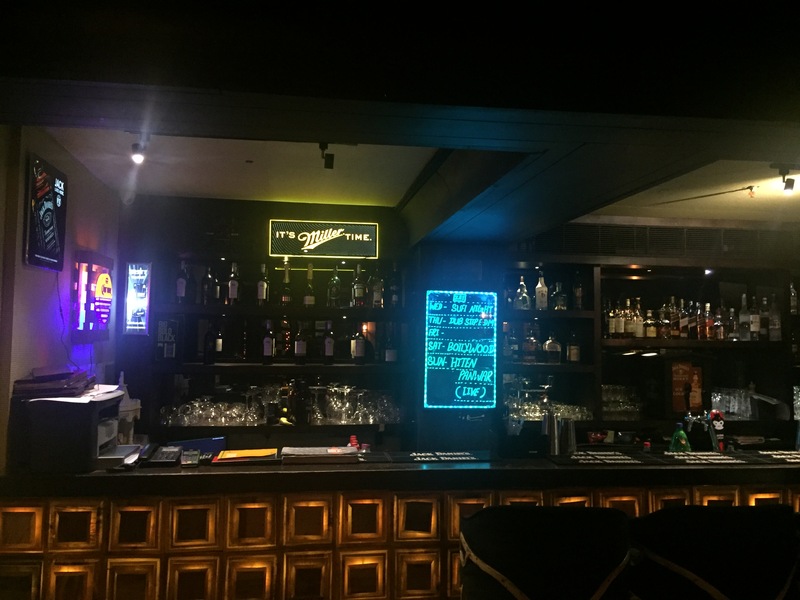 Nitin who has earlier worked at places like Skooter, Spectra Hospitality and Choko La likes the restaurant theme and outside seating while Prakash, the manager of the restaurant likes the young and decent crowd which comes to the restaurant. He is all praises of the food and cocktails here. One thing we noticed which making a trip for Nature’s call is that the way the washroom’s were labelled. 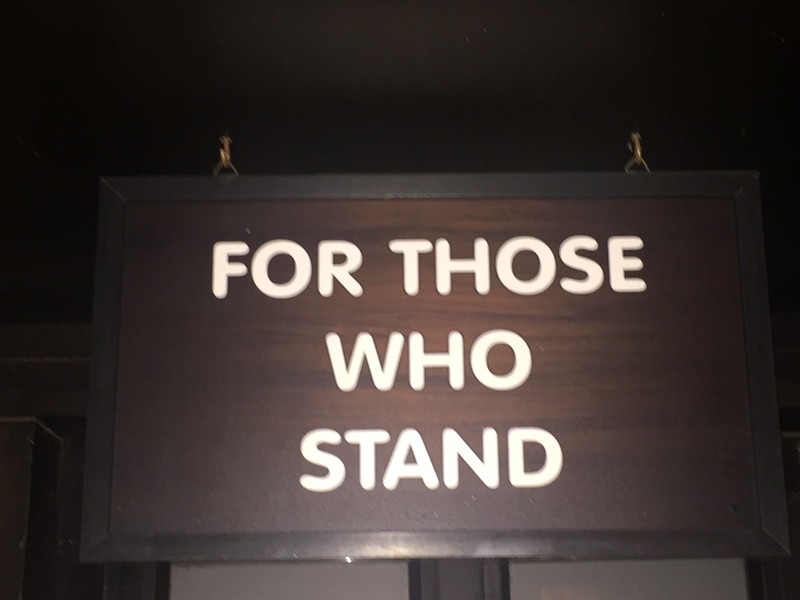 The women’s washroom was labelled as “For Those who sit” and men’s washroom was labelled as “For Those who stand“. What an innovative thought!! We had a great time at Zai and one thing which we vow by is the way the food was presented. Afterall, food is not what you eat but also what you see and sense. #MaggiTujheSalaam: A Tribute to Maggi! !